The order Orthoptera is divided into two major divisions: Ensifera (true crickets) and Caelifera (true grasshoppers). Ensifera includes the families Gryllidae (crickets) and Tettigoniidae (bush crickets; long-horn grasshoppers referring to their long antennae). Caelifera encompasses the true grasshoppers in the family Acrididae (short-horn grasshoppers referring to their short antennae). Orthoptera and allied insects have an incomplete metamorphosis (they are exopterygote). This means that they don’t have a pupal stage and that the immature stages (called nymphs) closely resemble the adults. Female adults lay eggs which vary in size and shape between species. The first instar (first nymphal stage) nymphs hatch (eclose) in the spring when the temperature is suitable for development and food is abundant, especially young, succulent vegetation. The number of nymphal instars (discrete nymphal stages) varies between species but most Acrididae have four nymphal instars and most Tettigoniidae have five or six. Nymphal development takes about two months and the adults usually emerge in July. Males and females mate after a courtship display in which song (stridulation) plays an important role. Females lay eggs throughout their adult lives. Each species has a preferred habitat for egg laying. The eggs of Tettigoniidae are always laid singly and those of Acrididae are laid in groups protected by a tough case (egg pod). It is possible to identify egg pods to species. The egg is the overwintering stage for most species of Orthoptera; development of the egg is arrested during winter (diapause). Hatching is triggered by increased temperature and humidity such as after spring rainfall. Nymphs first appear as vermiform larvae on emergence. Orthoptera hatch as “vermiform larvae” - newly emerged nymphs are surrounded by a protective embryonic cuticle (a thin membranous sleeve). Acrididae need to emerge not only from their egg shell but also from the egg pod. Additionally some acridids and tettigoniids lay their eggs in soil and the vermiform larva has to travel to the soil surface. It is only at the soil surface that the embryonic cuticle is shed and the first instar nymph emerges. Orthoptera song is produced through stridulation. A typical stridulatory mechanism consists of a file (series of pegs) and a scraper (thickened ridge). Rubbing together of the file and scraper produces the characteristic sound of Orthoptera. Acridid males are more effective at sound production than females. Their file is longer and has more stridulatory pegs than females. The prominent fore wing veins constitute the scraper. The space between the fore wings is thought to have a role in resonance. Some short winged females (such as the Meadow Grasshopper, Chorthippus parallelus) do not make any sound despite stridulatory movements. Male acridids are thought to produce five types of song during courtship and mating. The songs vary in intensity of sound, form of pulse and frequency of repetition. Single males or groups of males produce ‘normal song’ to attract females. Rival males in close proximity to a female can alternately stridulate in a ‘rivals duet’. Females sometimes respond through stridulation as they orientate towards the male. ‘Courtship song’ follows and this form can be elaborate and very different to the ‘normal song’. Some species combine song with dance. At the end of the courtship display males produce a short ‘assault song’ just prior to mating. In acridids, the male grips the female with his two fore legs and curls his abdomen beneath the female abdomen during mating. The male is hooked to the female through special structures on the male organ. The male sperm is transferred in a package called the spermatophore. During the process of mating the male continues to stridulate producing a ‘copulation song’. Female orthoptera position and lay their eggs through structures called ovipositors. In tettigoniids the ovipositor consists of three long valves. Acridids have short, stout anterior and dorsal valves with the inner pair also reduced. The acridid ovipositor is adapted for laying egg pods into the ground; the short, stout structure is used for digging and probing prior to egg laying. After each egg is laid the female injects a frothy secretion into the hole which mixes with soil particles to form the outer surface of the egg pod. When all the eggs are laid further froth is excreted to complete the egg pod. The long tettigoniid ovipositor is adapted for laying eggs deep into plant tissue or into the ground. There is considerable variation in ovipositor form between species and this relates to differing functions. Females select an egg-laying site after examining the substrate with the sensory palps (mouthparts). Some species use their mouthparts to bite through the substrate to assist oviposition. The ovipositor is covered with sensory hairs that allow the female to assess the oviposition site and the placement of the egg. Tettigoniids are relatively specific in oviposition site selection. The acridids all lay their egg pods in the soil. Like all insects, orthopterans are “ectotherms”, a term which signifies that they mostly rely on external sources of heat to raise their body temperature. The internal temperature of ectotherms, therefore, tends to vary, often tracking the ambient temperature of the immediate environment. To cope with this, ectotherms have developed various ways of controlling their body temperatures, for example basking on rocks, moving in and out of shade, and dilating or constricting peripheral blood vessels (see photos). In addition, ectotherms often have more complex metabolisms than endotherms (such as mammals), for example they may have many (up to ten) enzyme systems that operate at different temperatures for an important chemical reaction. Despite these adaptations, ectothermic animals are often more reliant on environmental conditions than endothermic animals. Therefore, they are often constrained to certain microclimatic conditions and, so, changes in climate can trigger corresponding changes in the distributions of ectothermic animals. Therefore, highly mobile, ectothermic insects, such as grasshoppers and crickets are regarded as valuable indicators of climate change. Long-winged Coneheads (Conocephalus discolor) have been expanding into new territories, with rising temperatures under climate change a likely factor. Until the 1980s they were confined to the South Coast, but they can now be found north of Leicester. 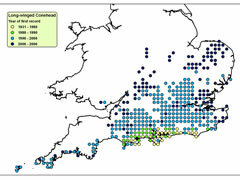 Similarly Roesel’s Bush Cricket (Metrioptera roeselii) was largely restricted to the Thames and Solent Estuaries in the mid-20th century, but is now seen across south and central England up to the Midlands. Many insects in the UK also undergo arrested development in winter, a complex physiological process known as diapause. There is another form of arrested development known as acquiescence. Acquiescence ends as soon as conditions are favourable whereas diapause is not terminated even if ambient conditions are suitable for insect activity. Therefore, diapausing eggs do not hatch until diapause has been completed and even warm weather does not stimulate premature hatching. Diapause is a common phenomenon in insects, for example adult ladybirds enter diapause during winter and undergo reproductive maturation during this period. Temperature and rainfall are major mortality factors of the egg stage. Eggs laid in soil are vulnerable to waterlogging and egg diapause has precise temperature requirements. Natural enemies of Orthoptera are also important mortality factors. Microbial pathogens (fungi, bacteria, viruses and nematodes) are important natural enemies of all Orthoptera. The prevalence of these pathogens is predicted to increase with climate change. A number of parasitoids (parasitic Diptera (flies) or Hymenoptera (wasps) with complex life cycles intimately connected to the host) attack Orthoptera. Chalcid (Hymenoptera) wasps lay their eggs into the eggs of Conocephalus dorsalis. Scelionid wasps from the genus Scelio are egg parasites of acridids. Some species of acridid are attacked by Blaesoxipha laticornis (Diptera: Sarcophagidae) as adults. The female fly is viviparous - instead of laying eggs onto the host, she deposits young larvae onto the grasshopper cuticle. The larvae invade the body cavity of the host and emerge from behind the grasshoppers head as final instar (last stage) larvae ready to pupate in the soil. Ectoparasitic mites are commonly seen on the bodies of Orthoptera in mainland Europe but rarely in the UK. Warmer UK temperatures could increase the occurrence of these mites. There is very little information on the predators of Orthoptera although birds, small mammals and reptiles have been observed feeding on them. A number of invertebrate predators are known to consume Orthoptera, including spiders, Sphecidae (hunting wasps), Vespidae (wasps) and Asilidae (robber flies). Tettigoniid nymphs and all stages of acridids have been seen in the low-level webs of the spider Agelena labyrinthica. 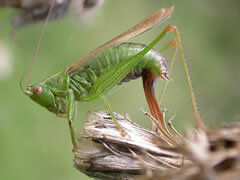 Some bush-crickets are predatory and consume grasshoppers or younger stages of their own species. The Orthoptera Species File is a taxonomic database of the world's Orthoptera, both living and fossil.